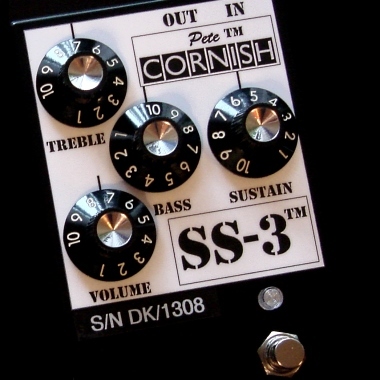 The PETE CORNISH SS-3™ is great for crunchy rhythm and a nice thick bluesy lead; the sound is very much like an overdriven vintage valve amp. The SS-3™ is currently being used by Noel Gallagher of Oasis, and is also a firm favorite of David Gilmour of Pink Floyd and Lou Reed. It has the best bottom end retention ever heard in an effect, whilst the mid-range is sweet and very transparent. The SS-3™ retains all the tonal nuances of your guitar and will make it come alive. It is subtle and yet capable of amazing power and sustain. Using the SS-3™ with a clean amp it is possible to progress from subtle overdriven amp sounds, through rhythmic crunch, up to a blues' lead. The tonal characteristics and dynamics of the guitar are maintained even when using this pedal at its maximum gain. The input to this unique device is our universally acclaimed High Impedance, Unity Gain, Class A, Buffer Preamp with it's superior RFI rejecting capability (to eliminate Radio Station interference) and Low Impedance Audio output, allowing the use of extended cable runs from the SS-3™ in bypass mode. The fixed High Impedance load presented to the Guitar allows the pickups to operate at their optimum, even when several effects units are connected after the SS-3™. The Unity Gain Buffer also prevents Ghost Distortion being audible in Bypass Mode. Our effects get the most benefit from being fed into a clean, full frequency response amplifier and I recommend that when you receive your pedal you connect it up without anything else in line, just Guitar/Pedal/Amp, and discover the way the controls interact, both with themselves and the guitar/amp controls. Adding the rest of your effects, you may find that you need to make slight adjustments to these to compliment the constant signal provided by the SS-3™. The LO-CUT control provides an attenuation of -20dB at 60 Hz when set fully Counter Clockwise. Set fully Clockwise the lo-cut control returns the frequency response to that of the original SS-2™. The HI-CUT facility on the SS-3™ has been designed to provide an attenuation of -14dB at 6KHz when set fully Counter Clockwise. Set fully Clockwise it provides a +6dB Boost to the Harmonic Content of the signal. Settings of the HI-CUT and LO-CUT in-between CW and CCW will provide varying amounts of boost and attenuation: experiment to find your optimum settings. DC adaptor: the size of the coax connector is 5.5/2.1mm and the centre pin is negative -VE. The voltage rating of the adaptor should be noise free, fully stabilized at 9.6V DC and capable of supplying 20mA. We recommend the use of the BOSS PSA series adaptors PSA-100/110/220 or 240 depending on your local AC supply voltage as meeting the above criteria and cannot accept any liability for damage caused to this unit by the use of, or to, any other type of AC/DC adaptor. An adapter proving an output of an AC voltage should not be used as it will permanently damage the SS-3™ - such damage is not covered under our warranty. After extensive testing for both noise, stability and reliability we have pleasure in recommending the Voodoo Lab Pedal Power 2 Plus as being suitable for powering our range of stand alone pedals - particularly when multiple effects are in use. The isolated outputs of the Pedal Power 2 Plus prevent the occurrence of ground loops and the noise level is too low to measure. ©Pete Cornish™ 2007 E. & O.E.